Innovation is in our DNA. We're constantly evolving the product to make data capture faster and more user-friendly. There’s much more to Zuant than tradeshow lead capture, but it’s a great place to start. View and edit your data in the cloud before downloading as a .csv file or releasing to your integrated systems. 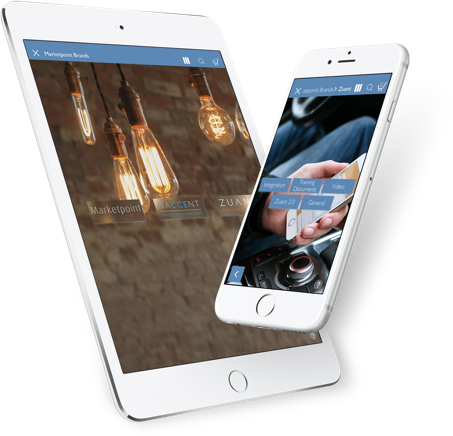 Add your marketing brochures, specsheets, videos and images to Showroom to record product interest and present from your device. For those busy flurries of booth activity, you simply scan, park, repeat. Leads save locally to finish up later. Build up a library of form templates for all your events. Hone your forms over time for a fully polished experience the whole team understands. Configurable prize draw feature pulls in the crowd and adds buzz to the booth! Scan business cards quickly and accurately. Ideal for smaller shows or the open road. Built from the ground up to work seamlessly wherever you happen to be. Sync and go - Zuant will take care of the rest. Weight your answers to assist in qualifying your leads. Help steer your sales follow-up in the right direction. Real-time reporting enables ongoing monitoring of your booth performance, and swift follow-up of your leads. Graphs display booth traffic and the efficiency of your sales team, incuding leads captured per user throughout the day. No badges at an event or in an everyday meeting? Not a problem. Take a photo of the business card and Zuant will transcribe it and populate your form. Build custom data capture forms using Form Builder. With an extensive range of data capture widgets and layout tools, you are put in precision control of your form design and layouts. Email hot leads to sales straight from the app; send personalized follow-ups as soon as visitors leave your booth. Be ever ready to present and share information. Upload PDFs and present literature and videos right from the device even when offline. You can attach files as links to a ‘thank you’ email, too. A more visual approach to your content. Showcase your products in a fully branded showroom with easy navigation. Idea for self-service kiosks and retail. Making initial contact capture a breeze. With support for all the mainstream badge types and API support for the big players. Our friendly team will work alongside you and your team to get up and running smoothly. Help articles are stored in our Help Hub and we are on hand to chat through any troubleshooting either via in-app chat or via our 24/7 Call Center. Bullet proof data processing layer. Rebuilt from the ground up to accomodate enterprise grade compliance requirements and enable more sophisticated data processing tasks. At the centre of the Zuant universe sits the Vault. Nothing gets in without first passing through dedupe and data cleaning steps. All data is encrypted over the wire and at rest. Fully auditable data trails for account activity help facilitate GDPR compliance. A variety of consent management widgets are at your disposal. Fine-grained data syncronization keeps track of every change. Working in conjunction with intelligent dedupe, your data remains pure.